Please visit the links of the participants at the bottom.Here’s a perfect moment from my week. I hope you’ll share yours, too. I checked out a Black-Eyed Peas CD from the library and listened to one song over and over again while out and about with the kids this weekend (not many of the songs are appropriate for young ears). It’s a happy-happy feel-good song, and I wanted to share the video with the kids when we got home. But often, an official video isn’t appropriate for young eyes. So I knew a preview was necessary. Instead, I found this, which is a happy-happy feel-good video. Watch it before you read my commentary, below. I love it because while contrived, it speaks of the power of one person following her bliss at the risk of looking like a lone fool. And then a wave of 20,000 people following the bliss, as well.Tessa and I are now learning the dance moves, in case we one day find ourselves in a flash mob. Contrived or not, I find it hard to believe that you can get so many people to move in sync! I couldn’t follow the how-to video without a lot of practice, a personal coach, and probably a lot of alcohol. Have fun! Yes, the official video is a little…well MTV, but I do love the song. Have fun learning the moves! I love my Fergie moments too. We took our oldest son to the Black Eyed Peas concert on his 14th birthday last year in Snowmass. WOW! I LOVE this particular song because it’s upbeat and positive AND it’s just fun to sing and dance to. I LOVE that the one woman did what she felt (not caring what others thought) and got the entire crowd going. Contrived? Yes. But very cool! I saw this on Oprah.. thought it was so cool! What a fun song and dance to do with your daughter. I love the concept of flashmobs. I so want to join in one someday, I think they are very cool. I’m dying to see a flash-mob. DYING to see one. I’m kind of obsessed with them, actually. I loved it. Contrived, yes, but the experience of each of those individuals moving in sync with a group is a pretty authentic musical expression!!!!! The “ritual” of dancing as a group is pretty old, doesn’t matter to me how we come to participate. My kids adore this song, and they will drop everything to start dancing to it the moment it comes on – no matter who is around! We could all take a lesson from the woman in the beginning of the video – life is too short to not dance like no one is watching! Love this! 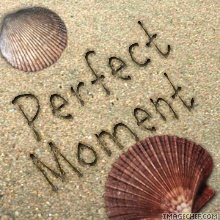 My perfect moment is also about a song. What is it about music? I love that song. I’ve never been a big fan of the band and I haven’t seen the video but I love the song. My husband loves this song and it came on the radio as we were driving to the hospital to induce the birth of Ellie in August. Technically she came the next day 🙂 but I still think of her when I hear it! I’m still waiting for everyone to decide my bliss is cool and jump on my bandwagon.